More often than not, clean and healthy living can prove to be quite a challenge. It is a lot easier to give up and return to your old habits than it is to eat healthy, and, subsequently, live a healthy and clean life. It is much easier to buy a cake in a store than it is to make your own cake at home. It is much easier to buy a soda or orange juice in a bottle than it is to make your own juice or smoothie. Or, so we have been told! The truth is, making your own meals and drinks is not that hard or complicated. In fact, it can even be fun. Best of all, you will know exactly what you are eating, because you made it. 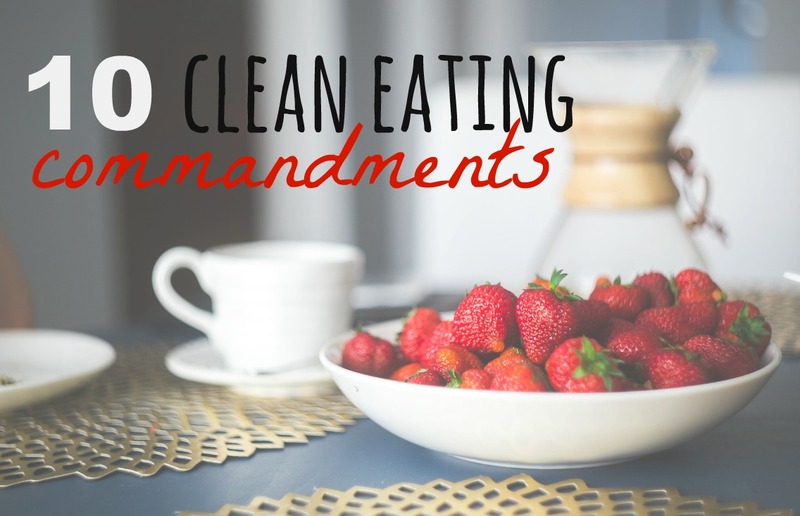 This is a list of 10 commandments you need to follow if you want to eat clean, healthy food. This means that you need to go to the basics of preparing food. You also need to know what foods you need to eat, what is good for your body, and what is not. Healthy eating primarily consists of eating fresh fruits and vegetables, beans, nuts and seeds. But, do not worry, this doesn’t mean that you won’t be able to enjoy the food. Whole foods are unprocessed foods like fruits and vegetables, whole grains, roasted nuts and seeds without added salt, skinless chicken and low-fat meat cooked or roasted with other vegetables, with coconut oil and virgin olive oil. All of the foods mentioned can provide clean diet and clean healthy living. Avoid buying food in packages or thin cans, and make sure that your food is fresh. This way, you will also avoid suffering from almost every type of eating disorder. Buy meat and fish from your butcher. Go to your local market, and buy fresh fruits and vegetables, roasted nuts, and whole grains like barley, corn, rice, quinoa and wheat. Choosing organic food simply means that you chose the cleanest food, food that is essential to your healthy diet plan. This is a food grown without pesticides, artificial fertilizer, and food free of hormones and steroids. You have to cook at home, at least, three or four times a week to fully appreciate healthy foods. You can also think of different clean eating lunch ideas for work, instead of going out for a ‘’fast food lunch break’’. Instead of ordering pizza or a burger, make your own. You have to believe me; you will feel great knowing that you can make your own meal. Breakfast is a most important meal. It sounds like a cliché, but it’s also very true. Breakfast is a great opportunity for you to practice ‘clean eating quick and easy meals’, like whole grains with low-fat yogurt, cinnamon, honey and big chunks of yummy fruits, or scrambled eggs with basil, olive oil, and homemade tomato sauce. Even if you buy food in packages, take a good look at the labels. If you can’t pronounce the ingredients, it’s probably full of preservatives, food and color additives that you do not want to be part of your healthy eating habits. Remember, you need and want to feel safe when you eat. This is important. Say no to anything that has ‘’added sugar’’ on it, stuff like chocolate bars, soft drinks, store bought cakes, milkshakes, syrups, and sauces. Sugar can be found in its natural state in all kinds of different fruits, and best of all, it is sugar that is tremendously good for you. Also, stay clear of saturated fat foods, like processed meat, regular cheese, dairy desserts, burgers, and pizzas. This may surprise you, but this is one of the most important things you have to do. This is also an essential part of clean eating for weight loss. You simply have to keep your body hydrated throughout the day if you want to live a healthy life. There is a huge misconception that clean diet can’t taste good. This cannot be further from the truth. Plan each meal in advance, and don’t be afraid to try new things. There is an abundance of tasty, nutritious, clean foods for you to try, and be healthy at the same time. Ways to prepare those foods are countless. If you want to live a healthy life, life full of energy and vigor, you need to eat food that is good for you. It’s simple as that. All you have to do is give those foods a chance. You won’t regret it. Sophie Addison is a popular blogger and skincare expert. She is very passionate about writing on skincare and beauty. She has posted articles on tips for weight loss, gluten free snacks and fitness news. Apart from work she likes gardening and listening music. You can also contact her on Facebook, and Pinterest.